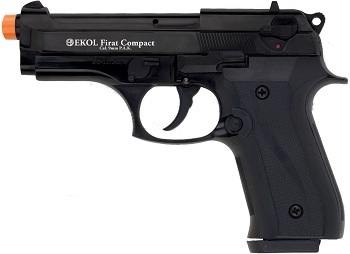 Image Below Or Add To Cart Beretta Front Firing V92-F Compact 9MM PA Blank Firing Gun Replica-Ekol Firat Compact: Our New Front Firing Smaller V92F Compact Fires Flame and smoke from the end of the Barrel. All blank guns sold in America must have the red tip at the end of the Barrel though it is my understanding that if the item is used in the theatrical, movie, or television industry the red tip can be removed. The famous Model Beretta V92F Compact automatic pistol is an official sidearm of the U.S. Army and other U.S. government agencies. Our authentic full sized fully operative blank firing reproduction Looks, weighs and feels like the original. They are great as Stage prop guns, Military and Police training, Gun Safety Training, Collecting, Display and Hobby: Caliber 9MM PA Blanks, Length 7 1/2”, Weighs 2.1/2 lbs, Rounds 15 +1 Includes 1 Magazine and a Hard-Shell Carrying Case: There is an optional 25 Round Magazine available for this Model. Beretta V92F Compact 9MMPA Front Firing Blank Firing Gun Replica.